You need to know about tools and electronic components before starting this tutorial - if you haven't read the Start Electronics Now! article, then read it now. 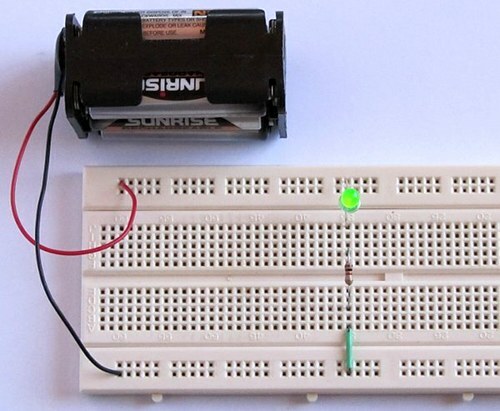 Learn about batteries, resistors and LEDs before starting this tutorial. This circuit diagram tells us (clockwise from the battery): Connect the positive terminal of the battery (red battery clip lead) to the 1 kilo-ohm resistor. Connect the other lead of the resistor to the anode of the LED. Connect the cathode of the LED to the negative terminal of the battery (black battery clip lead). Use the side cutters to remove a 1k resistor from the string of resistors if they are taped together. Cut the resistor lead as near to the tape as possible. Don't try to remove the tape as this will leave a sticky mess on the end of the resistor lead which will then end up in your breadboard. Bend the leads of the resistor as shown below. Plug one of the resistor leads into a hole directly below the cathode lead of the LED and the other lead into a hole below the middle channel of the breadboard. This connects the LED cathode to one of the resistor leads. It does not matter which way around the resistor is plugged into the breadboard. Insert a wire connector into a hole directly below the resistor lead and into the bottom rail of the breadboard. Plug the red (positive) wire of the battery clip into the top rail of the breadboard. Plug the black (negative) wire of the battery clip into the bottom rail of the breadboard. Finally plug the battery into the battery clip to power up the circuit and switch the LED on. Make sure to connect the battery clip to the battery the right way around. The opposite type of connector on the battery clip must be connected to the battery terminals, i.e. the battery and battery clip each have a pair of terminals and they will only connect to each other one way. If you try to connect them the wrong way, they won't clip together, but they will put reverse polarity on the circuit for a moment which may destroy the circuit, so be sure to connect the battery the right way around the first time. The red lines in photo below show how the breadboard is connected internally. The figure shows only some of the vertical connections, they repeat as shown. 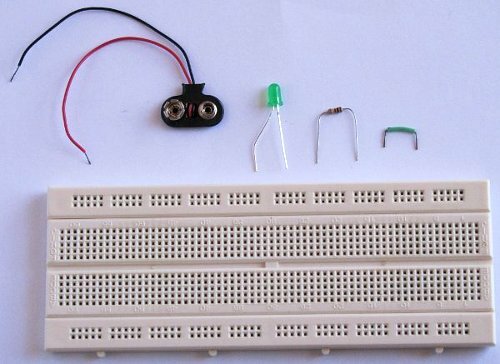 The top and bottom parts of the breadboard are identical and have four horizontal connecting strips. The middle of the breadboard has vertical connecting strips separated by a horizontal channel in the middle. Each individual red line or connecting strip is electrically isolated from every other strip. Any component lead that is plugged into a hole or "tie point" of the breadboard will be connected to whatever is plugged into a hole of the same connecting strip as marked in red in the photo. 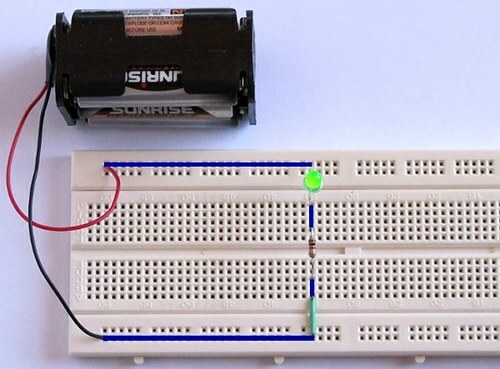 This photo shows the circuit built in this tutorial with the connecting strips of the breadboard that are used by the circuit in blue. The red lead from the battery is joined to the LED via the top horizontal strip of the breadboard. The LED connects to the resistor using a top vertical strip. The resistor is not shorted out because it jumps across the middle insulated channel of the breadboard to a vertical connecting strip below. The wire link connects the bottom resistor lead to the bottom horizontal connecting strip which is then connected to the black lead of the battery. I hope that you enjoyed this tutorial and found it useful. This tutorial was kept simple as an introduction to some basic electronic components and so that you can learn how a breadboard works before tackling more complex circuits.